Up until about one month ago, my chief concern when selecting a candle was what it smelled like. And where I'd put it. And what it looked like. And whether or not it would play nicely with the rest of my collection to create the dreamy bed or bathtime abyss I dreamed of. What's interesting, however, is that despite the fact that I work to eat a mostly organic, plant-based diet and have slowly transitioned my skincare and makeup routines to reflect a similarly holistic, nontoxic theme, I never thought twice about my candle collection. Or perhaps more specifically, whether or not said candle collection was toxic or sustainably made. Which, when you consider that it's something I'm burning inside the small confines of my apartment, is pretty crazy. Scary, even. Chen realizes the consumer addiction to candles is real. And anticipating that addiction while making mindful and important adjustments to keep the Skylar candles clean are what separates the launch from so many other options on the market. (Many of which are toxic—don't shoot the messenger.) What's intriguing, however, is how little we've been paying attention to the ingredients in our candles, especially considering how much we love them. "Candles are generally items we think of as instrumental to a relaxing night or creating a warm ambiance, but the unfortunate reality is that the vast majority of candles on the market have ingredients that can be potentially harmful to human health," explains Chen. And apparently, there are two important ways a candle can be toxic: via wick or wax. Wax: "Surprisingly, 95% of candles on the market today are made with paraffin (which is a petrochemical obtained from petroleum). Several university-level studies have shown that inhaling petrochemicals and ingredients derived from petrochemicals (like paraffin) can potentially cause harmful health issues," Chen says. What's interesting is that candle brands are not legally required to disclose the ingredients within their candles, so it's almost impossible for consumers to know when a product includes potentially unsafe ingredients. "A general rule of thumb we have found is that if a brand does not explicitly say 'paraffin-free' as it relates to its candles, the brand is most likely using paraffin in its candles (like 95% of the market)," Chen tells us. Oh, and don't fall for the words "soy blend" since "blend" is more than likely code for paraffin, which is inexpensive, durable, and easily accepts scent and color—making for great, albeit potentially hazardous, candle bait. Wick: "Historically, the majority of wicks had a lead core in them in the United States," Chen tells us. "Then in 2003, the Consumer Safety Products Commission banned the creation of lead-core wicks, however, it's estimated that as much as 30% of candle wicks still contain heavy metals, as the law states it must contain less than 0.06% lead by weight." TL;DR: Many candles can still lawfully get away with not being 100% lead-free. According to Chen, candles are tricky because you really can't tell all that much just by looking at them. However, sometimes you can glean some intel from their color. Here's what you should know. "Because you can dye wax, it can be in a variety of different containers and different ingredients, and the scent creation alone could also play into appearance and color changes. As mentioned, most candles on the market are made from paraffin because it is inexpensive, durable, and takes scent and color well. We have found that soy-coconut blended candles are naturally a creamy, rich slightly off-white color, while paraffin is a stark white." So how is Skylar setting the bar and changing the industry standards? 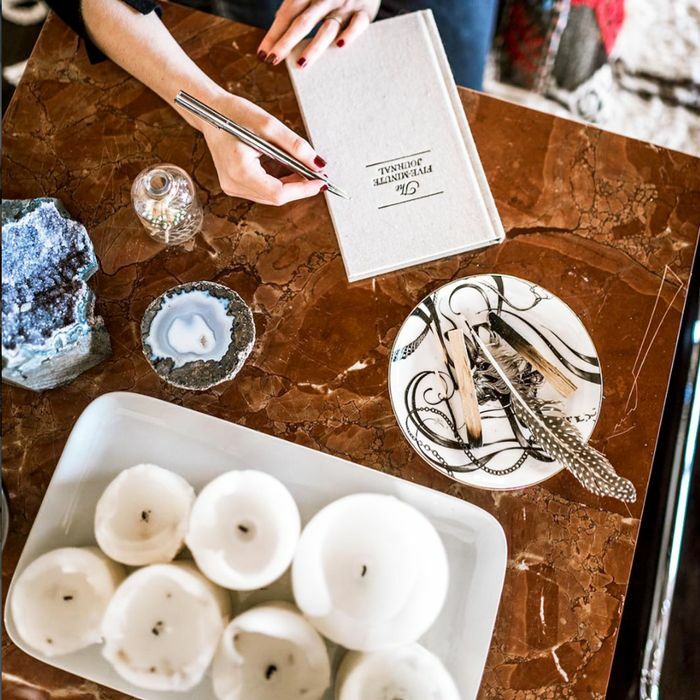 Well, in addition to creating a candle that's stunningly scented (and equally pleasing to look at), the brand utilizes a 100% healthy blend of coconut and soy—renewable resources that are farmed sustainably. "We chose to include soy from soybeans in our wax because soy is a clean-burning, toxin-free base that has the capacity to last longer. Soy is also biodegradable and you can easily remove it with soap and water, which was key for us, as we strive to create earth-friendly products," says Chen. Then coconut is added thanks to its super-sustainable nature and the fact that coconut is slow-burning and smooth in texture. 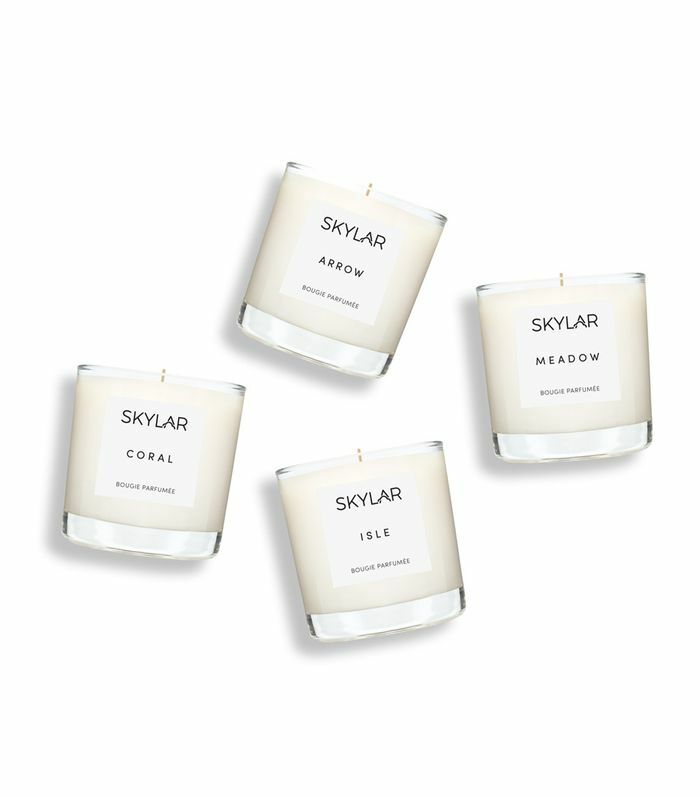 Not to mention that Skylar's candles boast non-lead wicks and are consciously handcrafted in Los Angeles. "The candle industry is a late bloomer as it relates to the clean lifestyle movement," explains Chen. "Our mission is to offer a better-for-you alternative, enabling the candle addiction to live on." Keep scrolling to discover each of the four candles, and if you like to take quizzes, we recommend taking the brand's scent quiz. My (and Features Editor Amanda Montell's) favorite Skylar scent, Arrow, is a rich, warmly alluring mix of midnight jasmine, warm patchouli, and vanilla. Plus (like all the candles), the ingredient list is refreshingly simple, featuring soy coconut wax, jasmine, rose, neroli flower, labdanum flower, vanilla, patchouli, tonka bean, birch tar, Schinus molle, and Skylar Body's own fragrance blend with natural and essential oils. Inspired by florals (but never too stuffy or precious), Meadow is the go-to favorite for Editorial Director Faith Xue and Wellness Editor Victoria Hoff. Key notes include breathy hints of tuberose, jasmine, and orange blossom, which when paired together, feel bright, refreshing, and yes, pretty much perfect for spring. If you feel most at home at the beach and love clean yet invigorating scents, we have a feeling Isle will be your olfactory escape of preference. Subtle citrus and just a bit of spiced sandalwood (not to mention a glass jar that can eventually be repurposed for a Mai Tai), this is basically a beach vacation in candle form. Last but not least: Skylar's Coral Candle feels one-part fruity and one-part floral. (In other words, it's a brilliant compromise between Meadow and Arrow.) Sunny and bright, you'll notice the apple blossom and sweet edge of grapefruit right off the bat. Our advice: This is the one and only time we'll ever advise you to light up. Enjoy!